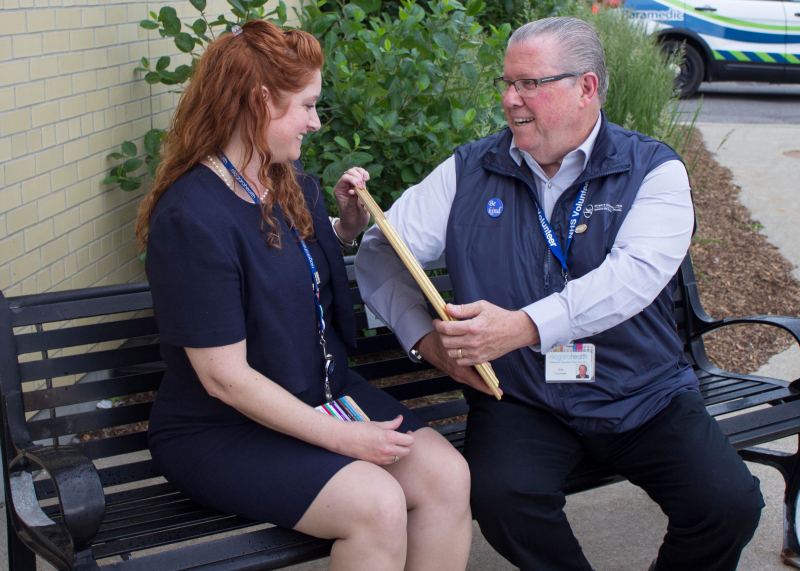 For Bob Hicks, volunteering at Niagara Health is a way to make people feel good. Bob volunteers for three hours a week in the Greater Niagara General Emergency Department. In November, Bob developed a severe case of pancreatitis that brought him to the Greater Niagara General Emergency Department. During that visit, he met one of our caring volunteers who left an impression on him. He was looking for a meaningful way to give back to the community and he realized volunteering at the hospital was something he had to do. He reached out to our Volunteer Resources team to apply, and during orientation, he met Volunteer Resources Coordinator Rachel Murphy. Rachel shared stories about the important role of volunteers and how through their caring and kindness, they make patients and their loves ones feel good. "Those words inspired me," Bob says. "And her enthusiasm is contagious." That night, Bob thought more about the impact he could have as a volunteer. He was looking at the Be Kind button that Rachel gave him and the words “I won’t let it be rare to care” and “I won’t just be kind in my mind” kept entering his head. He knew he had to put those words into a poem. Bob’s belief in the power and emotion of poetry and desire to create a more compassionate world collided. Bob used these words to create a moving poem entitled “The Canadian Volunteer.” The poem speaks to his commitment to act with kindness and compassion, which is also one of Niagara Health’s CORE values. He believes the poem is a snapshot into the mind of most, if not all, volunteers. Bob is one of 850 volunteers who provide extraordinary caring to our patients and their loved ones. Some of their responsibilities include, providing information and directions, assisting with mealtimes, providing water and blankets, and friendly conversation with patients and their loved ones. For more information on volunteering at Niagara Health, please call 905-378-4647, ext. 44630 or email volunteer@niagarahealth.on.ca. You can also visit the Volunteer page on the Niagara Health website here.